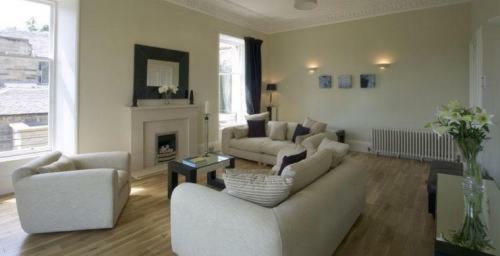 These stylish 5-star apartments are in the beautiful Grange area of Edinburgh. Each light apartment offers modern accommodation, free Wi-Fi, free parking and large flat-screen TVs. The Alba Executive Apartments are all located in one development 2 miles (3.2 km) south of Edinburgh city centre, the shops of Princes Street and Edinburgh Waverley Rail Station. The Grange is a quiet area of Edinburgh famous for its Victorian architecture, stone-built houses and large gardens. The bright apartments have large rooms, high ceilings and modern furniture. Each apartment has a well-equipped kitchen with refrigerator and washing machine.